Here’s a must-have accessory for your USB-C™ equipped MacBook Pro, Chromebook™ or laptop. 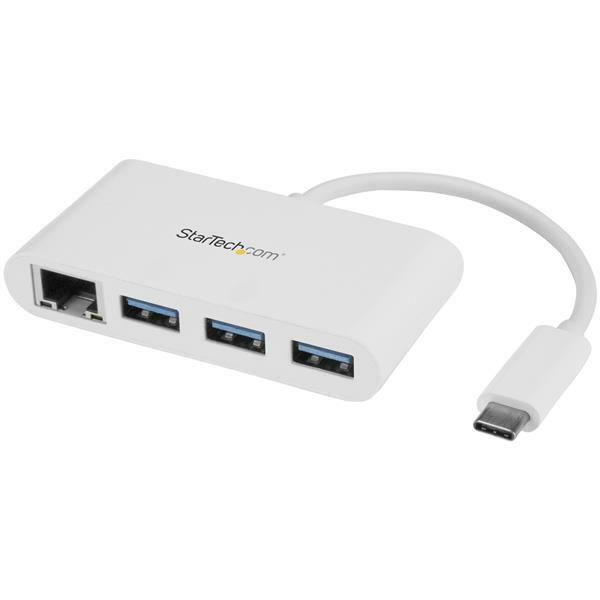 This USB 3.0 hub merges your USB peripheral and RJ45 network connections into a single combination hub. It gives you two vital connection types, with Ethernet and USB Type-A, which are often missing from modern laptops. This 3-port USB hub features an easy-to-use USB-C connector. 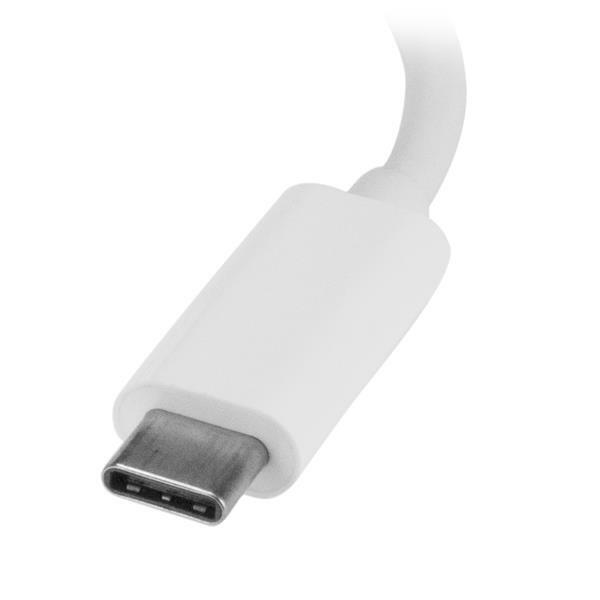 USB Type-C connectors are easier to insert than past generations. They're small and reversible, and you can connect the plug with either side facing up. If your MacBook or laptop is missing the ports you need, this hub can help. USB 3.0 is also known as USB 3.1 Gen 1. 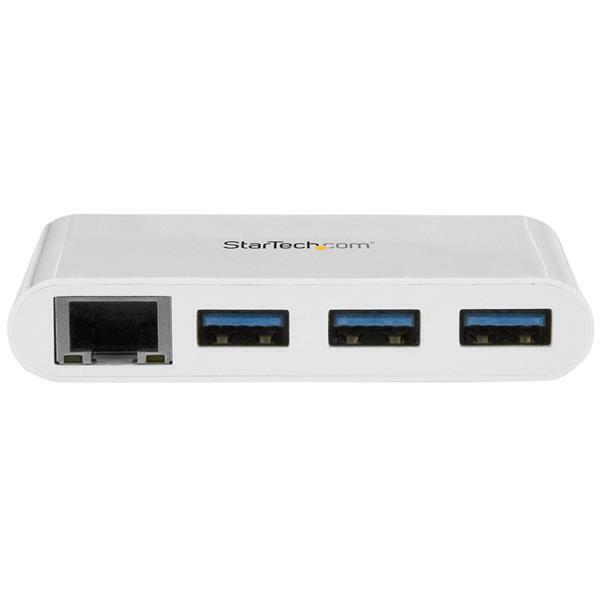 The versatile USB 3.0 hub gives you access to not only your USB peripheral devices but also a wired internet connection. It offers a Gigabit Ethernet port, so you can connect to a network in locations where Wi-Fi® is unreliable or unavailable. The stylish USB hub features an attractive white finish. The hub features a rugged yet lightweight housing, so there’s no need to sacrifice dependability for portability. Its USB-powered design means you don’t need to carry a separate power adapter, so you can tuck the USB 3.0 hub neatly into your travel bag. This hub is perfect for travel, and it takes up minimal space on a desk, so you can use it in hot-desk or BYOD (Bring Your Own Device) environments. The hub’s built-in USB-C cable makes connections easy, and you don’t need to carry a separate cable to attach the hub to your laptop. 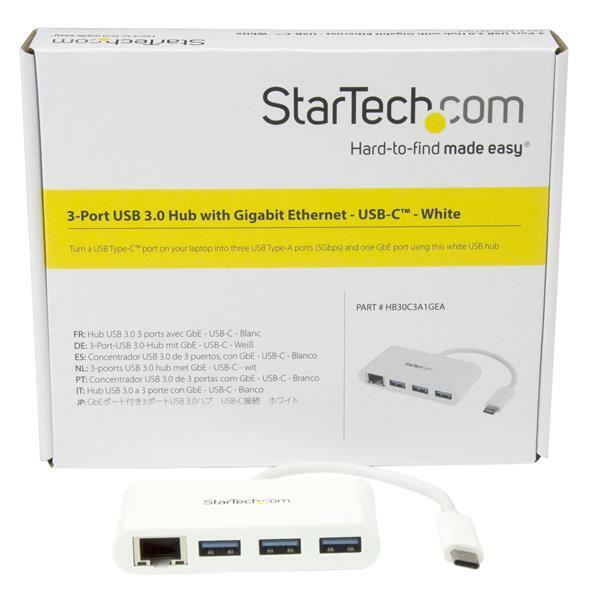 The HB30C3A1GEA is backed by a StarTech.com 2-year warranty and free lifetime technical support.